The systematic evolution of dental materials has led to a constant pursuit of technological innovations in orthodontics. Appliance biocompatibility, orthodontic treatment efficiency, and patient convenience are the major issues confronting today’s orthodontists. The orthodontic diagnosis and treatment plan often require retraction of upper anterior teeth. In these cases, premolar extractions or molar distalization can provide the required spaces. One of the biomechanical alternatives to space closure is the retraction of canines with sliding mechanics performed prior to incisor retraction. Orthodontists, when moving a tooth down a wire, have to contend with biologic barriers and mechanical phenomena [1,2]. Three of the mechanical phenomena are currently of interest because of the marketing of self-ligating brackets that are said to reduce resistance to sliding: friction, binding, and notching. These collectively determine the resistance to sliding a wire through a bracket or a bracket along a wire [1,2]. Self-ligating brackets were first introduced in orthodontics in the 1930s. Thanks to faster arch-wire ligation, these appliances decrease chair time while increasing clinical efficiency . As early as the 1970s, self-ligating brackets have been recommended to reduce friction between brackets and wires, deliver forces in more biological levels, reduce overall treatment time, improve plaque control and enhance patient comfort [4,5]. During premolar extraction treatment, the orthodontist has several options for space closure. A popular method is en-masse space closure with sliding mechanics and coil springs. Self-ligating brackets are labelled as passive and promoted on the promise that elimination of ligatures reduces friction and allows for faster sliding mechanics. If considered true, self-ligating brackets could reduce overall treatment time . The issue of friction and SL brackets is controversial . Many laboratory studies indicated lower friction levels for SL brackets, but their experimental designs were variable and might not simulate the dynamics of the oral environment. Therefore, it is questionable whether the use of SL brackets translates into clinical benefits such as decreased resistance to sliding, faster tooth movement, and increased treatment efficiency or not . According to Newton’s third law of motion, for every action, there is an equal and opposite reaction. According to which, forces used to move the teeth induce equal and opposite forces on anchorage units leading to possibility of their adverse movements . Here while retraction of the canine by different methods the opposite reaction comes as the protraction of the posterior section or the anchorage loss. The evaluation of the amount of the space of anchorage loss must be measured to check the clinical efficiency of the treatment mechanics and remove the bias. To evaluate the amount of anchorage loss some points are to be considered which are stable in nature and the evaluation of the distance of teeth from those points is checked time to time as the points are stable they give the idea of amount of anchorage loss. There are different methods to evaluate the amount of anchorage loss the radiographic, the palatal rugae are also considered as stable points from which the amount of anchorage loss can be calculated. Six orthodontic patients who needed first premolar extraction and canine retraction in the maxilla as a part of orthodontic treatment were selected. The patients selected were undergoing orthodontic treatment in the Department of Orthodontics and Dentofacial Orthopedics, Darshan Dental College and Hospital, Loyara, Udaipur. All patients received self-ligating brackets on one canine and conventional pre adjusted edgewise (PEA) metal bracket on the opposite canine within the same arch. The canine brackets used in the study were Damon 3 (Damon corp.) and conventional PEA metal bracket (Gemini 3M) with 0.022 MBT prescription. • Patients selected were explained regarding the procedure and a written consent was obtained for the same. • Case selection was limited to those teeth that were well aligned. • Patients who needed segmental canine retraction and first premolar extraction as a part of orthodontic treatment were included. • All teeth mesial to second molar – were fully erupted prior to the commencement of the study. • Excessive pain, root resorption or devitalization of canines during treatment. • A 0.18 stainless steel wire. Intra-arch sliding mechanics was used during the procedure of retraction and the canines were retracted down on a 0.018 inch stainless steel wire (Figures 1-5). Figure 2: Conventional PEA metal canwine brackets (Gemini, 3M). Figure 3: Flexible millimetre ruler. Figure 5: Rate of canine retraction. 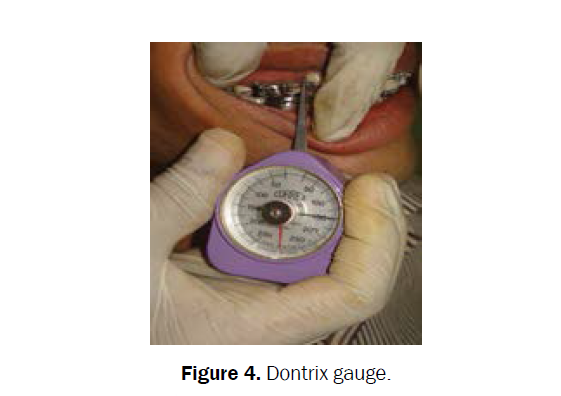 A closed coil spring of 9 mm was placed on the hooks of canine on one side and on the first molar tube hooks on another side for the retraction on both the sides and constant force of 150 gms measured every time by Dontrix gauge. Periodic evaluation – the evaluation of the amount of retraction completed was done in every cycle of 28 days. All the changes in the amount of retraction were measured intra-orally using a flexible millimetre ruler. Each measurement was made four times and the results averaged. The measurements were made to the one-half millimetre. Each patient received two different brackets placed on opposite canine teeth with in the maxillary arch. The canine brackets used in the study were Damon 3 (Damon corp.), and conventional PEA metal brackets MBT prescription. The remaining teeth were bonded with conventional PEA metal brackets (022 MBT prescriptions). Anchorage loss was recorded as the amount of movement in millimeters that occurred in the direction opposite to the direction of the applied resistance. 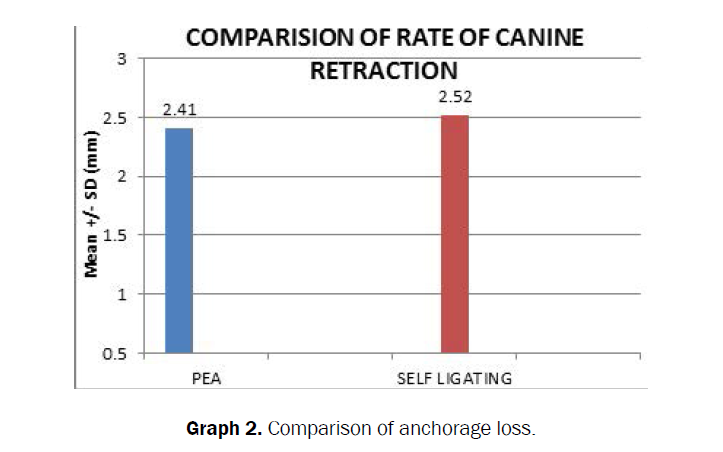 Photographs of pre-treatment and at the time of completion of canine retraction were taken and evaluated for the position of palatal rugae and the anchorage units and accordingly measurements in millimetres were recorded and evaluated as to compare the anchorage loss (Figure 6 and Graph 1). 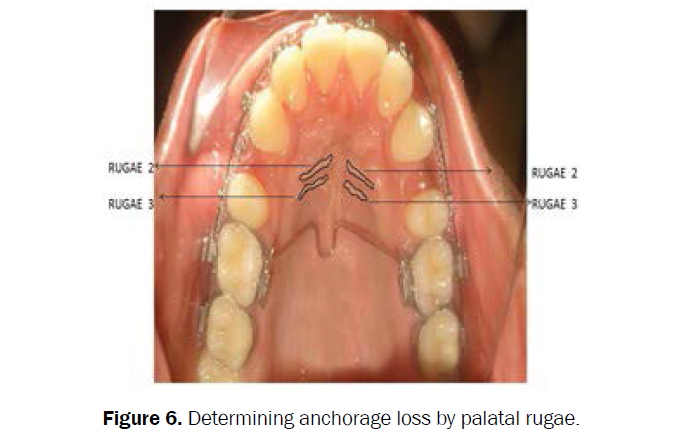 Figure 6: Determining anchorage loss by palatal rugae. 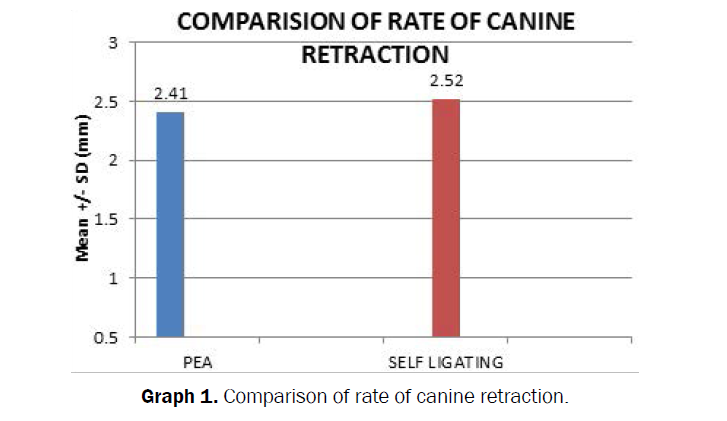 Graph 1: Comparison of rate of canine retraction. Descriptive data that included Mean, SD, minimum and maximum values were calculated for all the groups at each time interval. Mann-Whitney test was used for comparison between two groups. A P-value of 0.05 or less was considered for statistical significance. The patient sample consisted of six patients. All patients received self-ligating (Damon 3) brackets on one canine and conventional PEA brackets on the opposite canine within the same arch. All the statistical analysis was done by the Mann-Whiteney test. Tables 1 and 2 summarize the distance of retraction (total amount of retraction) for self-ligating bracket (Damon 3) and conventional PEA brackets systems. The maximum distance travelled by self-ligating bracket is 7.2 mm. Table 1. Amount of retraction. Table 2. Significance of amount of retraction. The distance of maximum travel in PEA brackets is 7.2 mm. The minimum distance travelled was 6.8 mm, with a mean distance 7.06 mm. The average difference in the rates of retraction was 0.07 mm/interval. Where the p-value was found to be P=0.34 which is not significant (P=0.05). Tables 3 and 4 summarize the anchorage loss. The self-ligating brackets maximum loss was 1.0 mm with a minimum of 0.2 mm and mean of 0.52 mm. The PEA metal bracket samples had a maximum anchorage loss of 0.8 mm and minimum loss of 0.2 mm and a mean loss of 0.45 mm. The mean difference in anchorage loss between self-ligating with metal slot samples and PEA metal bracket was 0.07 mm. The difference in the amount of anchorage loss was also not statistically significant (P=0.68, NS) (Graph 2). Graph 2: Comparison of anchorage loss. Table 4. Anchorage loss of self-ligating brackets and PEA brackets. Interest in self-ligating brackets is growing day by day in recent years. If we look at the results of the in vitro studies only the self-ligating Brackets are the revolution in the world of orthodontics the lower forces , reduced coefficient of friction [4,8], better oral hygiene, reduced resistance , high moment , ease of use , reduced cross contamination , less discomfort  all seems to help and increase the efficiency and the clinical scenario of orthodontics. But from scientific point of view each and every invention must prove itself to deliver better results in all conditions. From this view, it is important to evaluate these brackets clinically  and this split-mouth randomized clinical trial set out to evaluate this alleged performance clinically . In such conditions the efficiency of self-ligating brackets is quite conspirational. Ehsani proved by his study that the SL brackets produce low level of friction in vivo and in vitro studies also but the same results cannot fulfil the criteria in the higher rectangular wires. These factors has combine led to the promotion of Self-Ligating brackets on the assumption that decreased friction leads to enhanced clinical efficiency. However, our study also concurs with the growing body of evidence that there is no statistically significant difference in treatment efficiency between SL and CL brackets during retraction as many other researches and studies . Our study demonstrated that Damon 3 SL brackets were significantly no more efficient than Gemini 3M brackets in canine retraction during the orthodontic treatment. Clinicians can therefore use their preferred bracket type (conventional or passive self-ligating) without it affecting the rate of space closure in extraction patients. Although self-ligating brackets save time compared with conventional brackets when untying and ligating, once a SS ligature is tied at the initial placement of the SS archwire for space closure, it can be left for the entire duration of space closure without retying . The time saved for ligation would be greater at wire changes during initial alignment and in the final detailing stages of treatment. Subsequent well-designed retrospective and prospective clinical studies reported no significant differences in treatment efficiency between SL and during initial alignment and active space closure although the time taken for space closure was 6 months . Most of these studies evaluated the alignment efficiency of the mandibular anterior arch because rotations, irregularity, and small inter bracket distances are typically encountered in this region. It is strikingly surprising that self-ligating brackets have been advocated and marketed long before the publication of any clinical trials investigating their efficiency by independent sources . Anecdotal evidence and case series exhibitions do not substantiate the effectiveness of a biomedical material or a new technique, and it seems that more clinical studies are required in the mainly laboratory-based assessments of orthodontic materials and techniques. After more than a decade of the introduction of self-ligating brackets, the literature lists just a handful of clinical studies, of which even fewer satisfy the criteria of a prospective and randomized clinical trial. Most were conducted with treatment records of more than 1 practitioner or questionnaires filled out by patients. Moreover, even the few comparative trials available involve various malocclusions treated with many methods and modalities, thus precluding a means to isolate confounding variables. Rinchuse  states the position of the research conclusion about SL brackets with the reference of JCO editor Robert Kelin that in the Evidence Based Dentistry (EBD) the 3 models are accepted for the complete fulfilment 1st model states the experience based conclusion by clinicians and tutors, the second model derives from experience as well as the scientific results and the third one is results obtained from the systemic review that evaluates all the evidences. He suggest the second model is appropriate for the SL brackets as extensive research work is not done on SL brackets so studies are based on experience of clinicians and scientific results. In recent years, some reviews and meta-analyses have also been published that analyze the efficiency of self-ligating brackets . Although self-ligating brackets have some advantages compared with conventional brackets, there is insufficient evidence to claim that they produce less friction than conventional brackets in clinical usage . The results of the clinical and in vitro portions of our study also confirm this opinion. Although the rate of canine retraction between self-ligating (Damon3) brackets and conventional PEA brackets showed a clinical difference, it was not statistically significant. The anchorage loss for the same was also not significant. Refinements in PAE brackets by reducing the friction by reducing the ligation has introduced the designing of self-ligating brackets which are having a comparatively lower amount of friction in the means of ligation which has improved the amount of movement for more efficient and desired tooth position. Mezomoa M, et al. Maxillary canine retraction with self-ligating and conventional brackets. A randomized clinical trial. Angle Orthod. 2011;81:292-297. Burrow SJ. Canine retraction rate with self-ligating brackets vs conventional edgewise brackets. Angle Orthod. 2010;80:438-445. Pandis N, et al. Forces exerted by conventional self-ligating brackets during simulated first and second order correction. Am J Ortho Dentofac Orthop. 2008;133:738-742. Harradine NW. The history and development of self-ligating brackets. Sem in Orthod. 2008;14:5-18. Rinchuse DJ and Miles PG. Self-ligating brackets: present and future. Am J Orthod Dentofacial Orthop. 2007;132:216-222. Oz AA, et al. The clinical and laboratory effects of bracket type during canine, distalization with sliding mechanics. Angle Orthod. 2012;82:326-332. Almeida MA, et al. Study of the palatal rugae as landmark for analysis of dentalcasts. Angle Orthod. 1995;1:43-48. Ehsani S, et al. Frictional resistance in self-ligating orthodontic brackets and conventionally ligated brackets. A systematic review. Angle Orthod. 2009;79:592-601. Thorstenson BS and Kusy RP. Comparison of resistance to sliding between different self-ligating brackets with second-order angulation in the dry and saliva states. Am J Orthod Dentofac Orthop. 2002;121:472-482. Pandis N, et al. Moments generated during simulated rotational correction with self-ligating and conventional brackets. Angle Orthod. 2008;78:1030-1034. Cacciafesta V, et al. Evaluation of friction of stainless steel and esthetic self-ligating brackets in various bracket-archwire combinations. Am J Orthod Dentofacial Orthop. 2003;124:395-402. Miles PG, et al. A clinical trial of Damon 2 vs conventional twin brackets during initial alignment. Angle Orthod. 2006;76:480-485. Lotzof PL and Cisweros JG. Canine retraction: A comparison of two preadjusted bracket systems. Am J Orthod Dentofacial Orthop. 1996;110:191-196. Miles PG. Self-ligating vs conventional twin brackets during en-masse space closure with sliding mechanics. Am J Orthod Dentofacial Orthop. 2007;132:223-235. Thorstenson G and Kusy R. Influence of stainless steel inserts on the resistance to sliding of esthetic brackets with second – order angulation in the dry and wet states. Angle Orthod. 2003;73:167-175. Kim T, et al. Comparison of frictional forces during the initial leveling stage in various combinations of self-ligating brackets and archwires with a custom-designed typodont system. Am J Orthod Dentofacial Orthop. 2008;133:187.e15-187.e24. Pandis N, et al. Mandibular dental arch changes associated with treatment of crowding using self-ligating and conventional brackets. Eur J Orthod. 2009;1-6. Pandis N, et al. Maxillary incisor torque with conventional and self-ligating brackets: A prospective clinical trial. Orthod Craniofac Res. 2006;9:193-198. Pandis N, et al. Self-ligating vs conventional brackets in the treatment of mandibular crowding: A prospective clinical trial of treatment duration and dental effects. Am J Orthod Dentofacial Orthop. 2007;132:208-215.